Since the lion is only found in this part of the country, it is a tremendous attraction for tourists. Till 1971, before the enactment of the Wildlife Protection Act, lion “shows” were a regular practice, even performed by the Forest Department to cater to tourism. In such shows, lions used to be drawn to a kill, and tourists were escorted to the location. However, practice of using live bait was not in use at that time for tourism purposes. It was used on specific occasions such as lion censuses and sometimes, for rescue and treatment. Due to interventions by the judiciary, live baiting was completely stopped by the management soon. In recent years, Gir has witnessed an exponential growth in tourist numbers. The number of tourists pouring into hotels and resorts around Sasan is much more than the tourism-carrying capacity of the Park. A few lucky tourists get a chance to enter the tourism zone of the Gir Sanctuary but many less-fortunate ones return without even an entry. Those have managed to get tickets by standing in a queue for long hours on the previous night, feel unsatisfied if lions are not seen or if lions are just sleeping under a faraway bush. It is quite easy for dubious agents to entrap such disheartened tourists for a “sure shot lion sighting”, that too in live action. While baiting is illegal and unethical, watching the big cat in action is quite thrilling. Not just agents, but even resort owners try to satisfy the demands of tourists. They have connections with such agents, guaranteeing lion sighting on bait. A tourist spending thousands of rupees to stay in luxury resorts can easily pay for such an exciting event. Many a times, tourists don’t even know that they are violating the law and can bring serious legal trouble upon themselves as a few show organizers are, in fact, working for the Forest Department or have strong links with the officials. It has also been observed that some areas with a so-called “Satellite lion population” in the Amreli and Bhavnagar districts have proved to be havens for illegal lion safaris. A sizable number of local tourists from across the state and other parts of India now prefer a private lion show where they can spend entire night watching lions on a kill! The host has to arrange basic facilities for visiting guests and of course, live bait, usually a tethered cow or buffalo. For a tourist who takes part in such an illegal event, it is a thrilling experience. 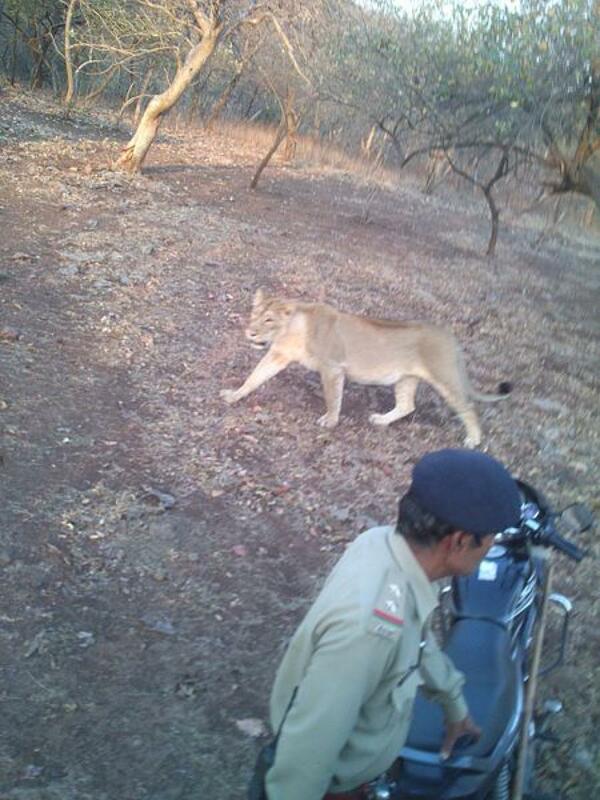 The uncontrolled tourism beyond Gir’s boundaries has made lions vulnerable. Such illegal tourism needs to be contained by strict law enforcement on the one hand and offering better tourism opportunities and promoting ecotourism activities in areas beyond Gir.